Even a minor, hidden water leak, untreated, can result in major mold problems and thousands of dollars in damage… and a severely mold-contaminated house can’t be lived in or sold! Once moisture combines with dust or mold-friendly materials like drywall, mold can start growing and spreading in as little as 24-48 hours.What should we look for when buying or renting a home? How can we choose a safe environment and avoid hazardous water damage that can lead to serious health issues? The following 10 guidelines are based in part on the book The Homeowner’s Guide to Mold by Michael Pugliese. Look for a low permeability rating (minimal chance of unwanted moisture entering the home). The building lot should have a high enough water table and be away from underground springs. The slope of the land is a key factor to avoid water running toward the house. Check crawl spaces to make sure there is no moisture. Crawl spaces tend to be damp and are therefore a challenge for mold avoidance. Does this home have a basement? Is it finished or unfinished? If it is unfinished, make sure the dirt is dry. Consider adding a vapor barrier before finishing. If it is finished, look for history of water damage. Carpeting is a potential problem. Check the drainage of the home. The roof should have overhangs to help carry drainage farther away from the structure. Check the flashing (a thin sheet used to prevent water intrusion). Improper flashing is a common cause of roof leaks. Ask about any history of roof leaks. Shingles at the eaves should project beyond the edge of the roof framing. Check gutters and downspouts to see that they are properly installed. 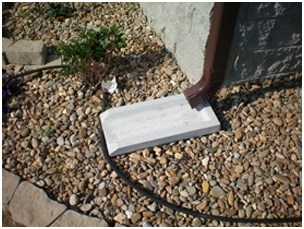 After your move, consider adding inexpensive splash blocks to gutters to help carry water away from the home. Be sure wood siding stops well above the ground to avoid stain and rot. Make sure windows are installed right side up so the weep holes drain properly. Avoid central humidification systems, if possible. Check to see that drip pans for cooling coils are draining properly. Check the locations of the closets. If a closet runs along an outside wall, the cold wall can meet the heated inside air and form condensation. Good quality construction will allow for proper insulation of these closets. An ERMI mold test can rule out the presence of toxic mold. This can be done by collecting a sample of dust and submitting it to a lab for analysis. It is important to rule out the presence of stachybotrys and other toxic molds. If you have experienced a prior mold exposure, look for a home with an ERMI value of 2 or less. A thermal inspection of the home can reveal hidden moisture. To learn more about thermal imaging, visit the Thermal Moisture Imaging website. For those with chemical sensitivities, it is best to avoid homes with air fresheners, recent pesticide treatments, and a history of smoking. For more suggestions on choosing or creating a healthy home environment, see the informative International Institute for Building-Biology & Ecology website or the excellent resource Prescriptions for a Healthy House. Management releases Resident from lease agreement if Resident’s health is affected by environmental factors associated with chemical sensitivity and/or mold issues. Following these guidelines can help you avoid health issues and financial loss. Be mindful of the current residents’ health and be sure to listen to your gut instinct overall. Choosing your next living environment wisely has the potential to benefit you and your family’s health for years to come.